Suzanne Rozdeba Looking down on the body (under white sheet). 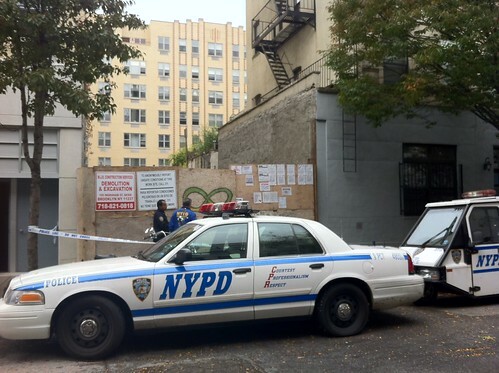 A dead body was found in an empty lot at 227 East Seventh Street this morning. Angel Carrillo, 43, a carpenter who lives near the lot between Avenues B and C, said that around 9 a.m., he heard a woman screaming hysterically. When he came to her aid, the woman pointed to a dead body lying face-down on the ground. Mr. Carrillo believed the deceased, who wore calf-length boots, was in her 30s. After telling Mr. Carrillo she didn’t know what happened, the person who made the initial discovery ran away. The police confirmed the body belonged to a woman in her 30s and said there were no visible signs of trauma, but had no further information about the ongoing investigation. The lot, where a building was demolished earlier this year, is due to receive a six-story condominium building. Update 2:50 p.m. The crime scene unit has now arrived. Investigators have been seen entering 111 Avenue C, where a police officer is posted, as well as a garden next to 115 Avenue C that borders the lot. Pablo, a resident of 229 East Seventh Street who did not give his last name, said that shortly before 9 a.m., he saw the woman from the third floor of his building, and that she was face-up (not face-down, as indicated by Mr. Carrillo), with mud obscuring her visage. She wore a v-neck sweater and black jeans, he said. The super of Eastville Gardens at 225 East Seventh Street, who was shown the body by investigators, said the woman was wearing a single sandal and not boots as indicated by Mr. Carrillo.